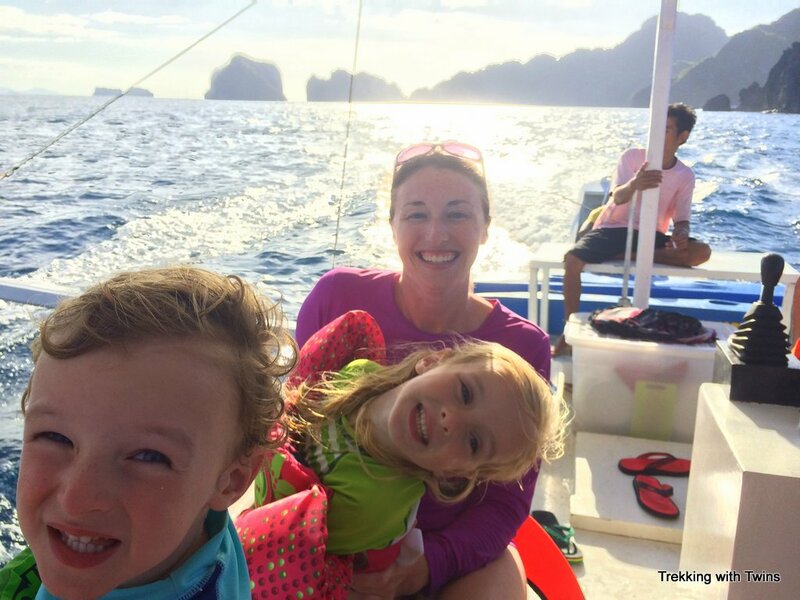 An El Nido vacation should be on your list of exotic family travel spots. But go soon, because word is getting out about this pristine paradise. First, by El Nido we mean the whole Bacuit Bay archipeligo area surrounding El Nido town proper. This includes the islands, the sea, and the area beaches like Corong Corong, Marimegmeg, and Las Cabanas. El Nido town itself is lively with lots of shops and restaurants, but the true charm and allure of the area lies in taking in the spectacular natural wonders. El Nido is rich with this natural beauty. World class beaches can be found around every corner, and you can have many of them to yourself or nearly so. White sand lined with coconut palms rustling in the sea breeze, arching over the beach. Crystal clear blue water dotted with traditional banca boats. The towering limestone karst cliffs and mountains jutting out of the sea make for dramatic sunsets – the best we’ve seen anywhere in the world. Sunset from Corong Corong Beach. On top of all that the people are welcoming and excited to share their beautiful surroundings with visitors. A big part of what made El Nido, and the Philippines in general, such an amazing place to visit was the seemingly inexhaustible friendliness of it’s people. So how do you visit this paradise? We’ll show you the way. Now we’ll fill in the gaps so you have all the information you need to plan your family vacation to El Nido. El Nido is located at the northern tip of Palawan, an island in the western Philippines. It’s not the easiest place to get to, but that’s a big part of why it’s still so pristine. The most common way of getting to El Nido is fly to Puerto Princesa, the largest city on Palawan, located about midway along the east coast. Flights to Puerto Princesa are available from various cities, including Manila, Cebu, and Iloilo in the Philippines. Once in Puerto Princesa, the most common method to get to El Nido is to take either a shared van or a bus to El Nido. The vans make the journey in less time (4 to 6 hours depending on the driver, time of day or night, and number of stops) but the buses (7 hours or more) may be more comfortable. We rode vans both to and from El Nido, and to be honest it’s not a great experience. But the beauty of El Nido makes the trip worthwhile! Safety Tip: In our experience the van drivers in the Philippines have a tendency to drive excessively fast for the road conditions. If your driver is exceeding the speed limit and you feel uncomfortable don’t hesitate to ask him to slow down. There are also often phone numbers posted inside the vans with signs indicating you should call or text if you feel that your driver is operating the vehicle unsafely. Besides the shared vans and buses, we’d recommend also checking with your hotel or resort in El Nido. They may have their own van or be able to make arrangements for you. While the van service may not be any better if it’s still provided by a 3rd party, at least there is some accountability if your resort arranged the trip for you. You can also fly to El Nido, though it is relatively expensive and your options are limited for routes – flights only go to/from Manila. Fares range from 4,000 to 6,750 pesos ($90-150) one way depending on season. There is also a restrictive 10kg limit on baggage weight, and you pay 100 pesos per kg over that. Book flights through the Artcafe Travel Center. To be honest if we go back to El Nido in the future we would strongly consider flying. On this trip we wanted to see Sabang on the way north, so we would have missed that if we flew. We also were really trying to keep costs down. 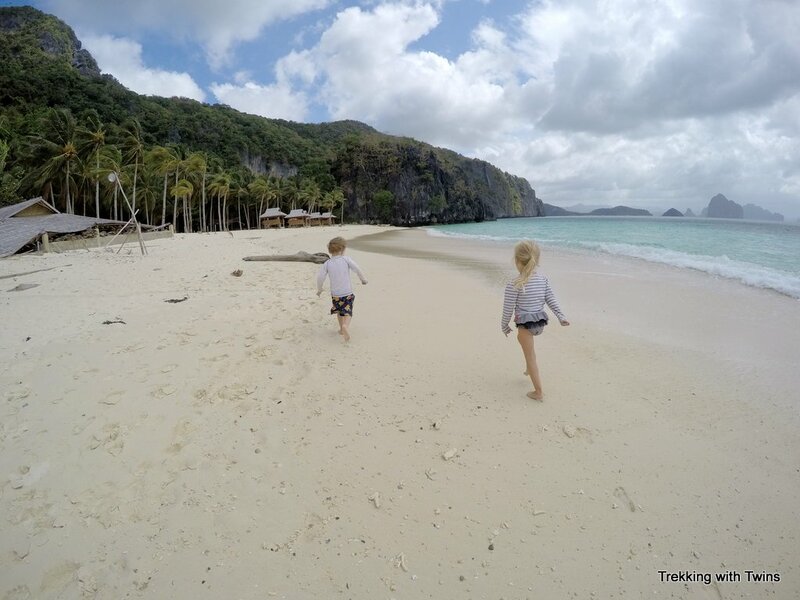 But if you are making a special trip to see El Nido for your family vacation it may be worth the added cost to fly directly from Manila, especially if you have limited time. The van ride is really not fun. Finally there are seafaring options to reach El Nido. From Puerto Princesa, take a van to Sabang, and then arrange a trip north along the coast from there. Talk to the tour desk at Green Verde Resort. This option is probably only suitable if you are very flexible in your time frame as the boat isn’t scheduled to every day and is likely also dependent on the number of passengers interested in making the trip (even on “scheduled” days). There are also boats between El Nido and Coron. Check with the Artcafe Travel Center for details, but from our research we would strongly recommend against this option for families. As we understand, it is a long journey (8+ hours) across rough open ocean in relatively small boats with a questionable safety record. We have heard that there are also options to go by sea from Manila, though we don’t know further details. 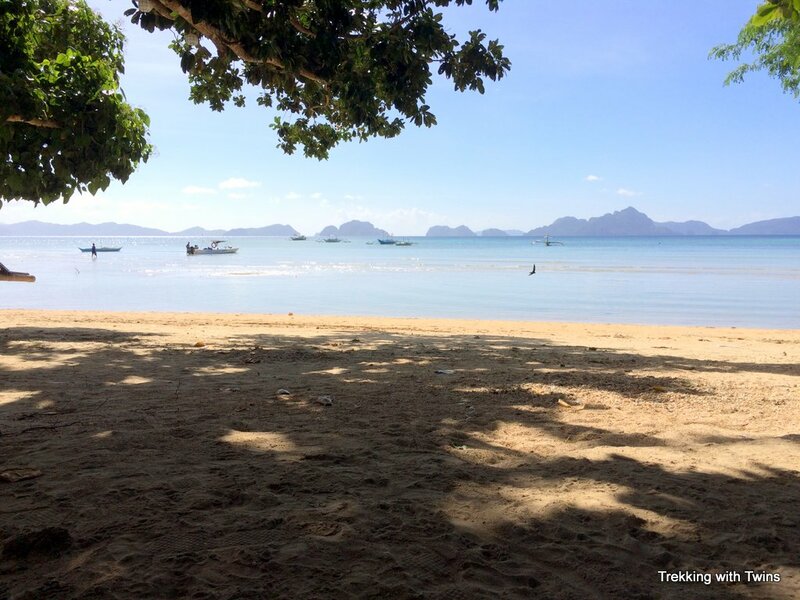 We stayed on Corong Corong Beach, which is just south of El Nido town proper and we loved it. We highly recommend the Corong Corong area, primarily because the beach at Corong Corong is much nicer than the beach in El Nido town. Corong Corong was clean, quiet, and calm, while El Nido beach is busy and somewhat dirty, with rough surf and many boats. 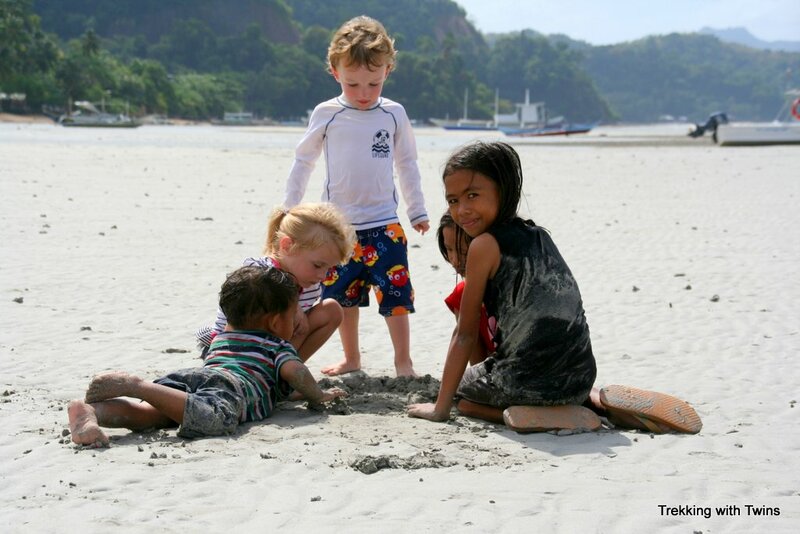 The sand at Corong Corong slopes gently, making it safer for kids (do watch for sea urchins though – good advice for any beach in the Philippines). At low tide the water retreats quite a ways, leaving tidal pools, “rivers”, and sand flats for kids to play. Making friends on the sand flats of Corong Corong Beach. Several resorts line Corong Corong Beach. We can’t say enough good things about Telesfora Beach Cottages, where we stayed. They have lovely family rooms steps from the ocean, free kayaks, great food, and super friendly staff. We could not have been happier than we were with our stay at Telesfora. Book a room at Telesfora Beach Cottages. There are other options though, including Greenviews and Island Front which are both in a similar price bracket as Telesfora. Slightly more expensive is Stunning Vistas Resort. We ate at all three of these resorts while we stayed at Telesfora and while we didn’t see the rooms, we can say the beach at Telesfora is nicer than any of them. There is more shade, and there is always plenty of sand at Telesfora. At the others the beach is reduced to a small strip of sand, or no sand at all, at high tide. Corong Corong Beach at Telesfora Beach Cottages. 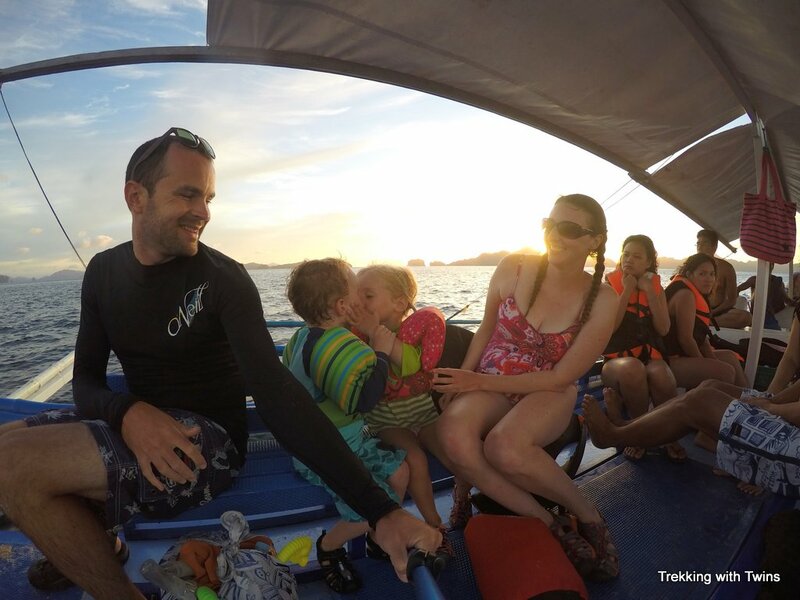 We wouldn’t recommend staying in El Nido town proper for a family vacation. Corong Corong Beach is a short trike ride from town (about 5 minutes and 50 pesos, $1) so going in for dinner or shopping is easy to do. The town is quite busy with a lot of traffic and noise. The streets have no sidewalks making walking around a bit treacherous with little ones. Regardless of the area you choose, there are many options in all price ranges for places to stay in El Nido. 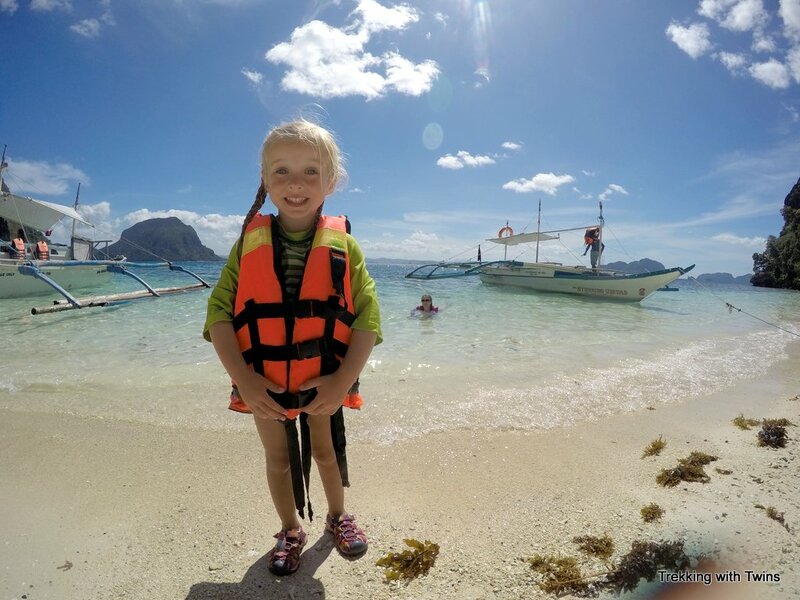 The activities in El Nido primarily revolve around the ocean. 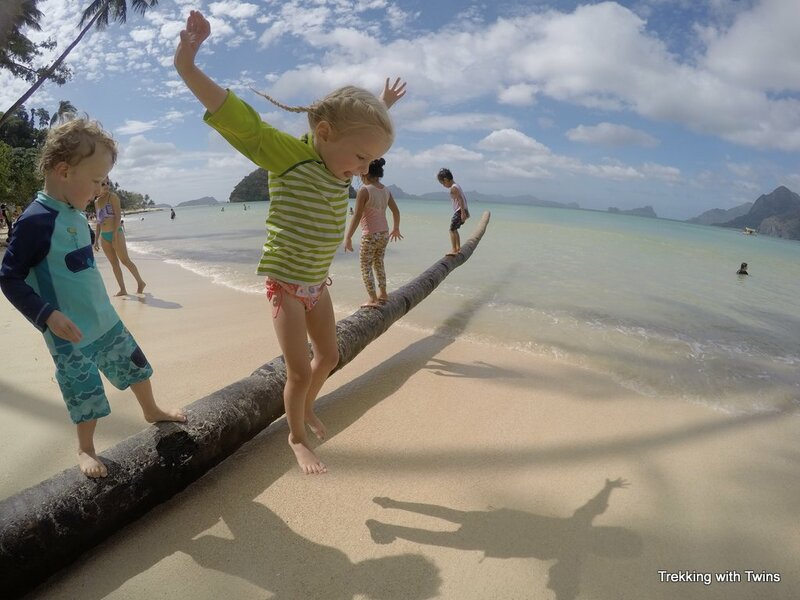 Our favorite pastimes included island hopping tours, kayaking, and just relaxing on the gorgeous beaches. As far as beaches, El Nido will spoil you. You will forever go to other supposedly spectacular beaches and say “ya, it’s ok, but El Nido was better”. Don’t say we didn’t warn you. You don’t get tired of beaches like this. Island hopping in El Nido is big business. There are 4 standard tour itineraries and you can book them from any number of tour operators or resorts. 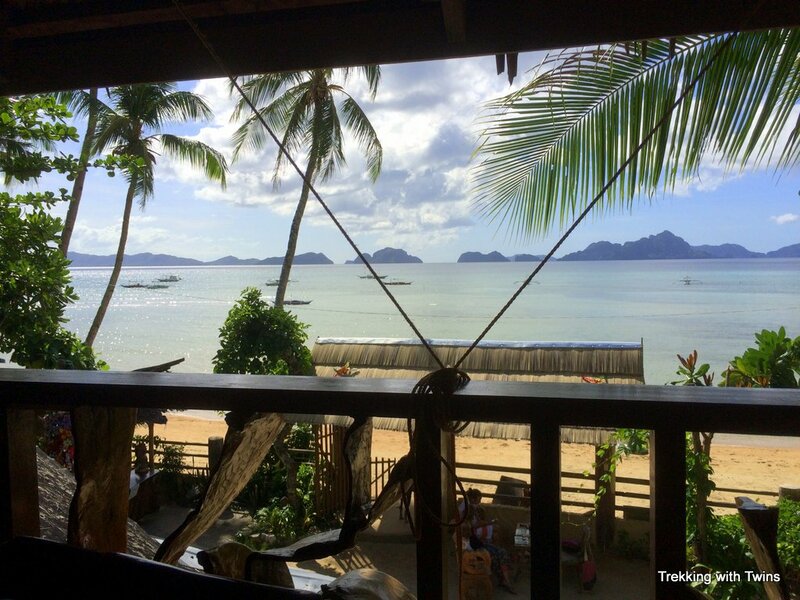 Read about all the details in our comprehensive post about El Nido Island Hopping. If you go on island hopping tours you will see some stunning beaches including 7 Commando, Pinagbuyutan (Honeymooner’s), Helicopter, Paradise, Hidden, Secret, and Bukal Beaches. Kayaking is a great way to see some of the more out-of-the-way El Nido beaches. We couldn’t get enough and kayaked almost every day that we didn’t go on an island hopping tour. 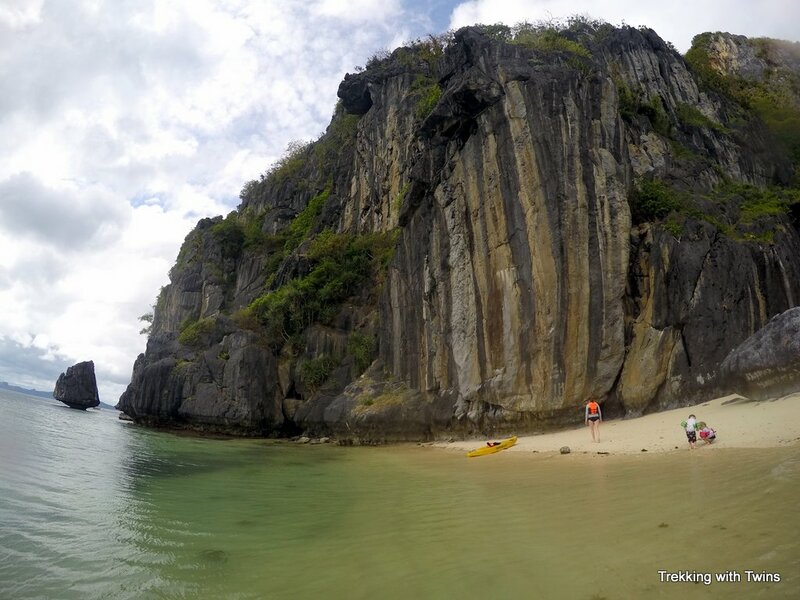 Read about some of the best spots to see in our post on Kayaking in El Nido. Check out Papaya Beach which you can access by kayak (it’s just south of 7 Commando). There are also countless other small beaches that may have names but we don’t know them. You can just land your kayak and check them out. Do be respectful though, as some are private. Look for signs or ask if it’s ok to use the beach if you see someone around. One of the secluded beaches we found kayaking in El Nido. 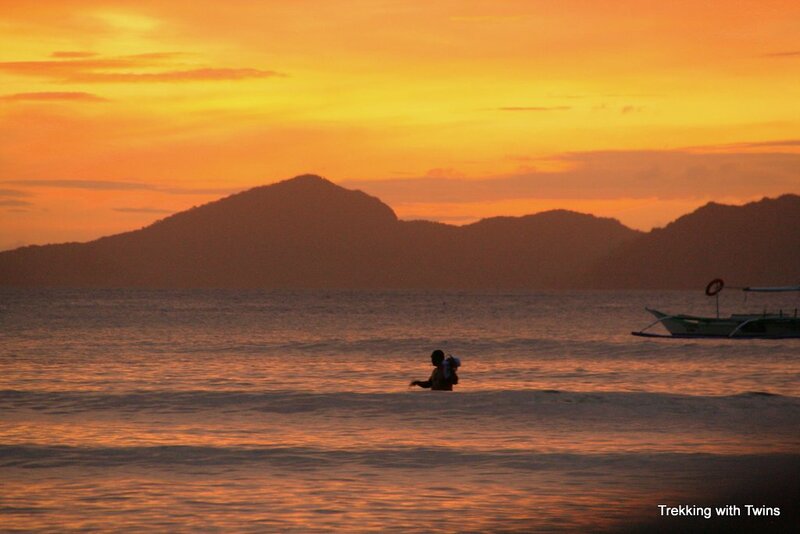 By land you can get to Marimegmeg Beach and Las Cabanas Beach easily from either El Nido town or Corong Corong. These adjacent beaches are the epitome of tropical paradise. A trike can bring you to either one. When we went to Marimegmeg we paid a trike driver 200 pesos (about $4.50) to drive us round trip. We actually just paid 100 pesos for one way, but the driver waited for us apparently assuming (correctly) that we’d need a ride home too. There were many other trikes at the beach though, so it shouldn’t be a problem to get a ride if your driver doesn’t wait. The two beaches are right next to each other, and in fact you probably wouldn’t know they are two different beaches unless someone told you. You can walk the full length, from one end of Marimegmeg to the far end of Las Cabanas, in about 15-20 minutes (no need for separate transport between them). Marimegmeg is essentially undeveloped with just sand, coconut trees, and water. There’s a small restaurant and bar near the south end where it abuts Las Cabanas. Out in the water there’s a small floating platform that you can swim to and hang out. Jumping with excitement at Marimegmeg Beach. Las Cabanas, just south of Marimegmeg, is a bit more developed. There are a few restaurants and bungalows along the shore. You can also access the zip line that flies across the water to the small adjacent island from this beach. Views from Las Cabanas out across the water are particularly nice because of the surrounding cliffs. Walking on Las Cabanas Beach. We ate most of our meals on Corong Corong beach since we stayed there at Telesfora Beach Cottages. There are several options along the beach. Our favorite spot was Telesfora itself. While not a restaurant the kitchen staff there will cook for guests if you let them know in the morning that you’d like dinner. In our post about Telesfora Beach Cottages we wrote all about the delicious food we found there. La Plage, just north of Telesfora, was also excellent. This restaurant has a sophisticated menu that’s updated frequently based on available ingredients and a superb setting right on the beach. There’s even a swimming pool (under construction when we were there). Just south of Telesfora is 1209 Sunset Beach Bar. Besides drinks, this cozy place specializes in Italian style pasta dishes and we liked it enough to go about 3 times in the last 10 days we were there (it took us a while to realize they served food). The owner is super friendly and welcoming which makes the experience that much better. Also on Corong Corong are Greenviews and Island Front resorts, both of which have oceanfront restaurants. The food at both is good, but service is hit or miss. We often waited for an hour or longer for our meals at both places (not ideal with hungry kids). Waitstaff at both restaurants also occasionally displayed exceptional skill at avoiding eye contact when we needed something. The view from Greenviews Restaurant. Stunning Vistas, near the south end of Corong Corong also has solid food and better service. Besides a regular meal we also attended a Christmas Eve party there with a huge buffet and traditional dance performance. The owners and staff made us feel at home, which we really appreciated during that holiday time. The vistas are indeed stunning. If you walk down Corong Corong Beach for a meal keep an eye on the tide. We had a couple of very wet walks home after the tide came in while we were eating. Alternatively you can walk home on the road instead, though walking along the road presents its own safety issues. 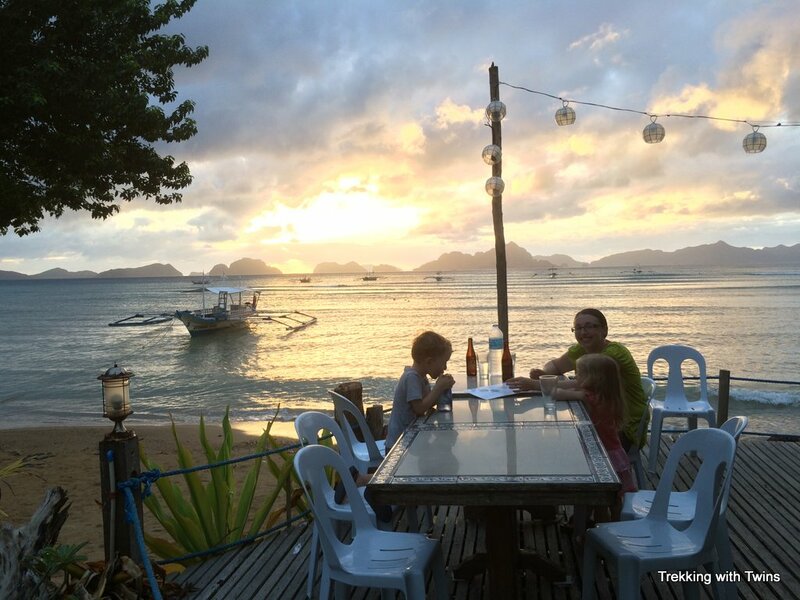 Our favorite El Nido town restaurant was Altrove. The pizza here is so good that people form a line out on the street almost every night. We arrived early one evening, right after our island hopping tour, and staked out a spot at the front of the queue. 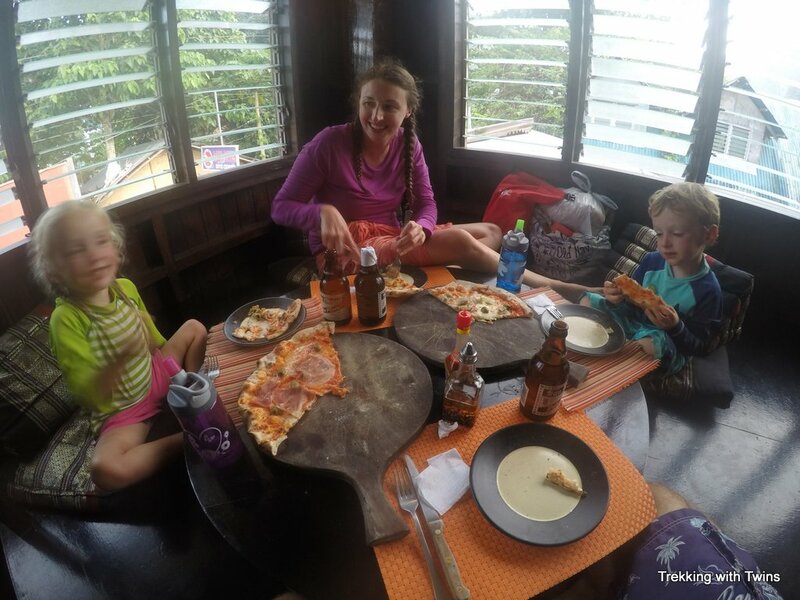 We weren’t disappointed and enjoyed some of the best pizza we’ve had in Asia. Altrove is on the east side of town, on Calle Hama which is the road right behind the beach (Calle Real is the next road inland). It’s near the Aquanaut dive shop. The restaurant itself is on the second floor and hard to see – only the brick oven is clearly visible at street level. Enjoying the pizza at Altrove. Art Cafe is typically packed but the business is well deserved. The food and service are excellent. As a bonus they accept credit cards without an added fee. This is important in El Nido where there are no ATMs. The Lonesome Carabo is a fun place on the east side of town. The highlights are some awesome Mexican dishes. We really enjoyed this change of pace from the typical Filipino and western food we had been used to. For delicious snacks, breakfast treats, and desserts, don’t miss the Midtown Bakery. We stopped here just about every time we ventured into town, often buying entire shopping bags full of baked goods at bargain prices. It’s the best place we found in the Philippines to get our carb fix. 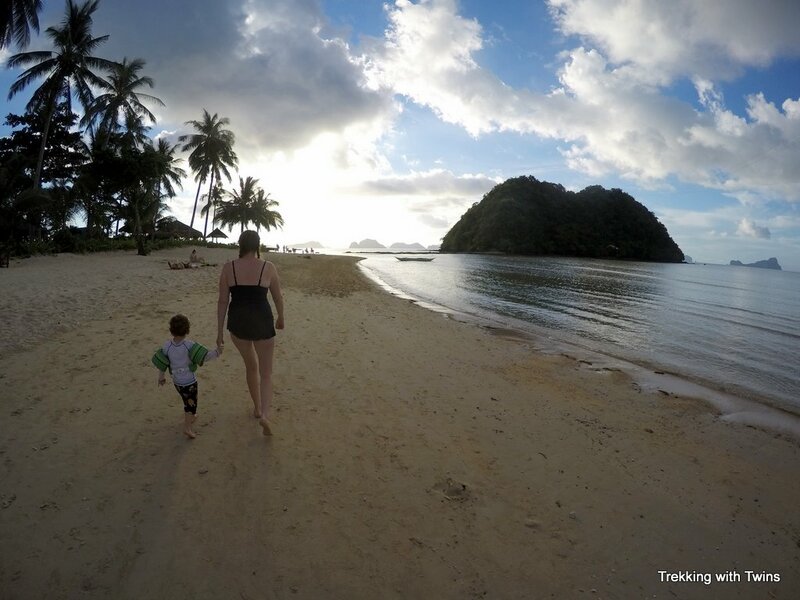 We easily met our $100 per day goal in El Nido. That’s total expenses for a family of four. Accommodation was $35 per day and food was $29. Transportation, including round trip vans from Puerto Princesa averaged to $5 per day. We did all four island hopping tours and our entertainment cost would have averaged about $26 per day if we had paid regular island hopping rates (Telesfora gave us discounted rates on our tours). The island hopping tours are typically 800-1,400 pesos ($18-$32) per person per tour. 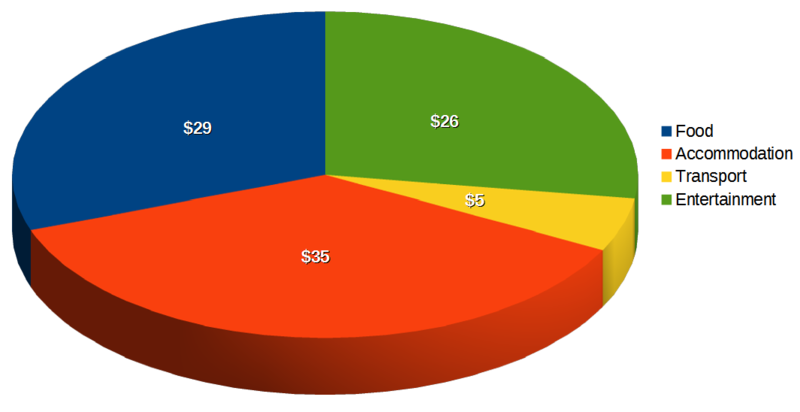 So altogether that’s about $95 per day living quite comfortably in paradise. Ready to visit El Nido? Find a great hotel for your family.